In the final days of summer, musician Ben Maddox sent me the longitude and latitude for God’s Little Brown Church in Alburgh, where he suggested we meet the next morning. He had recently become enamored with capturing the wild fish of Vermont on his Canon ELPH, which he’d waterproofed with a $20 Polaroid case, and he invited me to join him on a scuba-diving excursion. 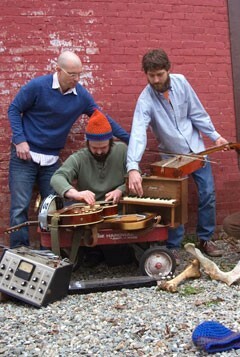 Maddox would later edit the resulting footage into a collection called “I See Fish People,” overlaying each video with a song by his band, local art-rock trio Farm. When I pulled up to the church, Maddox, clad in board shorts and sunglasses, was standing outside with a cocktail knife in one hand and a clam in the other. He had shaved the mustache portion of his Abraham Lincoln-esque facial hair to accommodate his snorkel mask. He suggested I do the same, and dug around in his Toyota’s glove compartment for a razor. But the search was in vain, my mustache spared. We drove into Alburg Dunes State Park, and Maddox pulled from his trunk an inflatable Calypso raft, a homemade weight belt — two 2-pound dumbbells tied onto an old leather belt — and half of a yellow strap once used for towing cars. He intended to sink a tripod to the bottom of the lake to keep his camera still despite the choppy waves. Maddox strapped on the weight belt, jury-rigged his camera to the tripod with a piece of plastic ripped from a DVD case and disappeared underwater. Last week all three members of Farm — which includes Joshua Givens and Jedd Kettler — were sitting in an assembly line in their studio, folding the liner notes of their new, self-titled album into 200 jewel cases. Since their inception in 2005, Farm have evolved into a kind of musical specter. They’ve released three beautifully written and recorded albums to an eager fan base. The upcoming full length is likely to meet high expectations. But Farm show no enthusiasm for playing anywhere beyond their Enosburg Falls practice/recording space — aka the Cave of Legends — located in the basement of Maddox’s record store and café, the Flying Disc. And, of course, filming fish. Farm members say they decided not to schedule any shows in support of the new CD because of the distractions of playing live. The essentially leaderless band’s complex arrangements often require members to swap instruments — and vocal duties — for each song. In a live setting, that becomes a sort of choreography. Instead of squealing fangirls and ringing cash registers, Farm’s songs now accompany high-definition images of yellow perch in slow motion and the skeletons of white suckers and muskellunge on a DVD. “When It’s Time” is one of Givens’ favorites of the 11 tracks that made it onto the album. The songs the band eliminated will join Farm’s deep catalog of near-perfect rejects, the best of which they plan to compile on an album called Beer Run. Back on the beach, Maddox caught his breath. He successfully sank the tripod, though the waves muddled the process. We drove up the road to a place called Mim’s Landing in search of calmer waters. After swimming through meters of muddy, shallow water without discovering a single fish, Maddox suggested we keep our bodies — except for our flippers — absolutely still. We did, and schools of colorful species began to emerge from the sunken weeds. He held up his camera and sank into the vegetation to capture the last shot of the afternoon. When we got back into the car, Maddox put on Farm’s album.